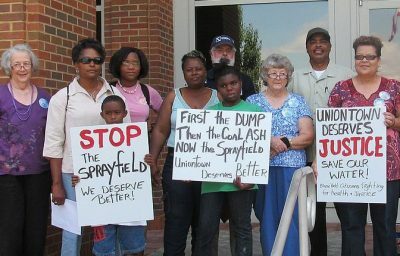 Members and supporters of Black Belt Citizens for Health and Justice, in Uniontown, Alabama. A community-based group building a Uniontown and Black Belt region where people unite, acting in love for shared liberty and justice for all. Black Belt Citizens is embracing and engaging solutions for health through campaigns for economic, environmental, and political justice. Uniontown, Ala., is the recipient of 4 million tons of the coal ash that spilled from the Tennessee Valley Authority’s Kingston facility in 2008, the largest industrial spill in U.S. history at the time. Since then, community members have experienced illness, perished farm animals, and other problems. Surface waters recently tested near the coal ash landfill showed levels of heavy metals above the acceptable limits set by the U.S. Environmental Protection Agency. Hear more about Uniontown’s story directly from residents in this 10-minute video. Side note: While the ash was being cleaned up, the company hired by TVA, which had a record of safety violations, failed to protect workers who were cleaning up the coal ash. Recently, 180 new cases of illness or death related to the unsafe working conditions during the cleanup have recently been announced. The EPA has dismissed their civil rights complaint (the agency dismisses such complaints 9 out of 10 times). But the Black Belt CItizens didn’t have time to slow down. 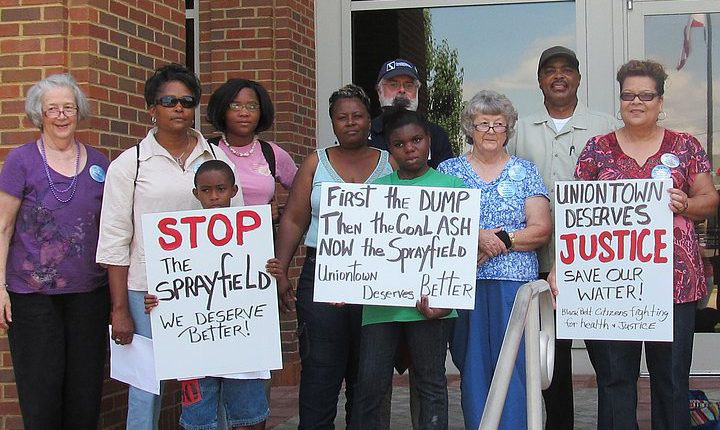 They have been busy getting comments submitted on Alabama’s draft coal ash rules, which are not up to par, while also dealing with recent wastewater overflows that are part of a long-standing problem. Black Belt Citizens is a small community organization on the front lines fighting multiple issues, and like most small grassroots groups, has loads of passion but not a lot of resources. If you are moved and able to send financial support,visit their donation page. Small donations welcomed as every little bit helps. Sign up for the Black Belt Citizens newsletter. For partnership opportunities, email Adam Johnson. To support the personal sacrifices made by Black Belt Citizens President Esther Calhoun, please feel free to write to her at 105 Jones St. Uniontown, AL 36786, and support her personally through this Paypal account. Appalachian Voice's North Carolina Program Manager, Amy has traveled from the blue waters of the Pamlico to the Blue Ridge Mountains surrounding Boone, and possesses a passion for protecting resources for all North Carolinians.